My 16th birthday is coming! I expect it for a long time! I plan to go NYC with friends to spend a delightful birthday weekend! NYC is my dream city, because there are so many fantastic restaurants and desserts shops hidden in this city! Yo-oh! I just learned of the good news that the rock superstar - Mr. Unicorn will hold a grand party tonight! All the unicorn fans are invited! Let’s join the rock star party & help Mr. Unicorn get to his crazy party on time! The music and the rock band are ready! Now, we only need more yummy desserts! I heard that a new famous Chinese restaurant opened yesterday! This is a big restaurant which contains a drama stage in the centre of the hall. Customers can watch the traditional Beijing opera while they have delicious Chinese foods! There are so many food options for this special lunch time! 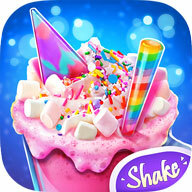 Such as vanilla strawberry ice cream cake, pizza, corn dog, burger and the most popular ice cream soda! Join us to cook, decorate and eat these yummy foods! Come on! Let’s get start right now! Here we come! OMG! This party is so cool! There are so many glow things I never seen before! Cindy is a big unicorn fan! 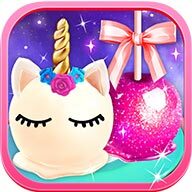 She collected many interesting things about unicorn! She is going to have a magic unicorn party at this weekend! All of us have received her invitation! Party day finally arrive! Everybody come to Cindy’s house! It's wonderful! It's ghostly! Here comes the treat or trick time again! My friend, welcome to the Horror Party Night to have fun with us! Summer is finally coming! I waited for a long time! I've got good news for you! There was a super cool ice cream shop opened in the downtown yesterday!This shop sells all kinds of the most popular ice creams! Hello everyone! We are Pepi’s Slushy Express - the most popular slushy brand in this city! We not only make various flavors of slushy, also we offer the order-and-delivery service! Our philosophy is yummy, fresh and fast! Summer Rainbow Frozen Foods Maker! The Summer Food Fair finally comes! This is the annual food fest for the whole city! Each year at this time countless super chefs will come here to sell their best yummy foods at the Summer Food Fair! Snow cones are the perfect hot summer dessert. Create ice dessert to chill out in summer season. Sit back and relax this summer with snow cone maker. It's Movie Time. What's better than go to movies with super sweet yummy snacks? Popcorn, of course is the best choice..
Today we have various cooking classes to teach everyone to make the most popular cake pops! Such as rainbow cake pops, classic cake pops, and my favorite rose cake pops! Popcorn Maker - Make the Perfect Popcorn! Watch out! Your popcorn will explode on your device! They look so real and so delicious! Your friends may want to eat those popcorn made by you. Welcome to the Rainbow Desserts Bakery! Here we can make various rainbow desserts together!